You don’t need to make a lot of marinade else you’ll destroy the flavour of the fish. This is just for a light brushing over the fillets, so make as much as you’ll need for however many fillets you have. Chop a few cloves of garlic and your herb leaves and mix that all together with the jam and butter. Take a moerse long piece of heavy duty foil and fold it double on a baking sheet. If you haven’t made the foil long enough, take extra foil for the middle and dome it out by pinching in the sides. This fish cooks very fast so be careful, over cooked dried out Angelfish don’t taste too good. There are many recipes for this flavour-some dish, most of which tend to use lots of vinegar and curry. In this recipe, Marietjie reduced the vinegar and curry. The result is milder, but it's still got lots of zing. 1.Lightly season the fish with salt before baking for 15 to 20 minutes at 180°C, until cooked through. 2. Cut the fish fillets into smaller portions. 3. Heat a little oil in a pan or saucepan, add onion and fry until they start to soften. 4. Add curry powder, turmeric, ginger and coriander and stir through. 6. Season with ground pepper and salt to taste. 7. Combine the cornflour with a little water into a paste and stir into sauce. Allow the sauce to simmer gently, while stirring, until it has thickened. 8. Let the sauce cool down. 9. Pack the fish fillets in layers in an airtight container, covering each layer with sauce. 10. Cover and allow to marinade in the fridge for at least 48 hours before eating. If you would like to try the full-strength recipe: increase the vinegar and water from 1/3 cup to 1/2 cup each. 1. Cook the potatoes in boiling salted water until tender, about 15-20 mins. Meanwhile, coarsely mash the sardines in a bowl (there’s no need to remove the calcium-rich bones as they are soft enough to eat). Mix in 3 tbsp chopped parsley and half the lemon zest and juice. Meanwhile, mix the mayonnaise and yogurt with the remaining parsley, lemon zest and juice and some seasoning. 2. Drain the potatoes, then mash until smooth. Gently mix into the sardine mixture and season. Shape into 8 fat fish cakes using floured hands, then dust lightly with the seasoned flour. 3. Heat half the oil in a non-stick frying pan and fry half the fish cakes for 3-4 mins on each side until golden and crisp. Keep warm; repeat with remaining oil and fish cakes. Serve with the lemony mayonnaise, salad and lemon wedges. Sift flour into a large bowl. Gradually whisk in combined milk, water and yolk until smooth and the consistency of pouring cream. Set batter aside for 15 minutes. Arrange chips on a baking paper-lined baking tray. Bake according to packet directions. Heat oil until a piece of bread sizzles as soon as it is added. Dust seafood in flour, a few pieces at a time. Dip into batter, draining off excess. Deep-fry fish fillets for 1 to 3 minutes until golden and cooked through. Drain on kitchen paper. Keep warm. Continue with remaining ingredients. Serve with a generous serving of tartare sauce. Peel the potatoes, cut into chunks, boil for 15 minutes until tender. Drain well. Cut fish into chunks and place in the bottom of a 2litre baking dish. Drain the sweetcorn and add. Put milk, butter and flour into a medium pan and heat, stirring until thick and smooth. Season and pour over fish. Mash drained potatoes with a little milk and spread over pie. Mix all ingredients together and form cakes, roll into flour and fry until golden brown. .
Poach haddock in water until flesh flakes easily when pulled apart with 2 forks. Drain, flake and set aside. In a sauce pan melt butter, saute onion and garlic until translucent. Add flour, stir until combined. Remove from heat, stir in milk a little at a time. Stir until well combined. Add cream, return to heat, bring to boil stirring constantly until thick. Remove from heat, stir in flaked haddock, cream cheese and parsley. Correct seasoning. Sieve the cake flour together with the creme of tartar and salt in a mixing bowl. Cut butter into small block and mix together with the flour using the tip of your fingers. Once the flour mixture forms crums add the soda water and brandy and mix well. Remove dough from the bowl and cover with cling wrap. Let the dough rest for 30 minutes in the fridge. Divide dough into two equal sized balls and roll the dough out on a floured surface until 3mm thick. Transfer dough into a glass pie dish, dish the filling into the bowl and cover with the remainder of the dough. Brush the dough with beaten egg. Bake at 220 degree celcius for 25 - 30 minutes until pastry is golden brown. Serve with a green salad. Mix together the 1/2 cup olive oil, cayenne pepper and paprika powder and pour over the fish. Sprinkle over the chopped coriander. You can sprinkle fresh coriander over to garnish. In a medium sized pot on high heat add a cup of water and a cup of vinegar , five bay leaves and some peppercorns ,2 teaspoons of turmeric and 2 tbsps of fish masala or packo masala ( pickle fish masala you may use ) and 1and a 1/2 tsp of salt . Bring to the boil and add six to eight onions that has been chopped/ ringed onions ... Add half a cup of sugar . Simmer for 8 to 10 minutes until all the flavours has infused into onions . Make the broth by boiling the water and adding the miso paste. Set aside. Make the cashew puree by heating all the ingredients in a saucepan, once the cashews are tender, drain (keep the coconut milk to one side) and blend until smooth. Strain through a sieve and set aside. Make the foam by placing the reserved coconut milk and vanilla seeds in a saucepan and heat to infuse. Add the water and soy lecithin and blend with a hand blender to form a foam. For the ginger, place all the ingredients in a saucepan and simmer until reduced by ¼. Strain and allow to cool. Heat a pan, rub the salmon with the oil and pan-fry for 2-3 minutes on one side then turn and cook for a further 2 minutes on the other side, until medium rare. Serve the salmon with the miso broth, asian salad, cashew puree, coconut foam and ginger sauce. Try this fantastic alternative to takeaway - ready in less than half an hour at just $2.50 a serve. 1. Bake the fries as directed on the pack. Combine flour, vinegar and ice-cold water. Mix to a smooth batter, adding more water if necessary. 2. 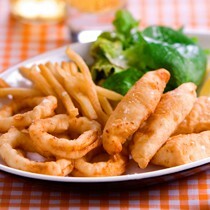 Dip fish and squid into batter. Deep-fry in moderately hot oil until crisp and golden, about 3-4 min. Serve with fries, garden salad and lemon wedges if desired. chilli sauce, season and toss everything together until combined. 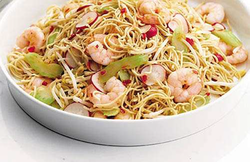 Divide between plates and serve with extra chilli sauce to drizzle over. Thislovely seafood pot is best when served with a nice garden salad. It’s enough for 6 people and a # 3 pot is recommended. 1. Wash the mussels under plenty of cold, running water. Discard any open ones that won't close when lightly squeezed. 2. Pull out the tough, fibrous beards protruding from between the tightly closed shells and then knock off any barnacles with a large knife. 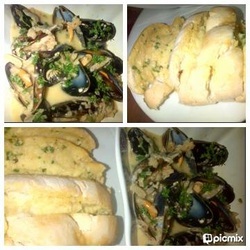 Give the mussels another quick rinse to remove any little pieces of shell. 3. Soften the garlic and shallots in the butter with the bouquet garni, in a large pan big enough to take all the mussels - it should only be half full. 4. 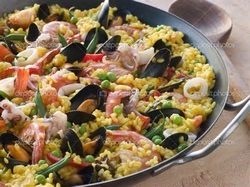 Add the mussels and wine or cider, turn up the heat, then cover and steam them open in their own juices for 3-4 minutes. Give the pan a good shake every now and then. 5. Remove the bouquet garni, add the cream and chopped parsley and remove from the heat. Cook the couscous according to the package directions, substituting the lemon juice for some of the required water. When it is done, fluff with a fork and toss in half the lemon zest and half the minced parsley. Melt 1 tablespoon of the butter over low heat in a heavy skillet and add the garlic and tomatoes. Cook over low heat, stirring frequently, until the garlic and tomatoes are soft and fragrant. Do not let the garlic burn or get crispy; let it cook slowly in the butter. Turn the heat to medium and add the second tablespoon of butter and the white wine. Whisk constantly and bring the wine to a simmer. Cook until reduced by half. Add the shrimp and cook over medium heat until cooked through - or, if using cooked shrimp, poach until just warmed through - about 2 minutes. Pour over couscous and eat immediately. 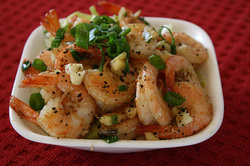 Add shrimp and deep fry for 20 seconds. Remove and drain on paper towels. and serve with Fresh Lemon! Thread the salmon and tomatoes alternately onto the skewers, allowing 3 pieces of salmon and 4 cherry tomatoes for each skewer. You should end up with roughly 3 skewers per person. Of course, if you are serving other varieties of kebab then they'll go a lot further. Spray with oil and cook on a medium barbecue, turning gently until just cooked through: about 5 minutes. Serve with a spoonful of creamy salsa verde. Very finely chop or process all ingredients except for the yoghurt. Adjust the consistency by adding a drizzle more oil if very thick. Taste and add more lemon juice if needed. Fold into the yoghurt and serve with cooked salmon or other barbecued foods. Try salsa verde as an alternative to mayonnaise or hollandaise sauce or as an accompaniment to roasted meats and roasted vegetables. A alternate salmon chunks with cherry tomatoes as both cook quickly. Salmon is also very rich (and pricey) so I allow around 85g per serve and cut the salmon into cubes the same size as the tomatoes. 1- Heat water in a tier steamer. Season the couscous, then toss with 1 tsp oil. Cook for 3 mins until the salmon is cooked and the broccoli tender. Drain the broccoli and run it under cold water to cool. 2- Mix together the remaining oil and lemon juice. Make the tuna cakes in advance and serve them as a snack with drinks at your next dinner party. For the TUNA CAKES, mix all the ingredients together and form small cakes with your hands. Arrange the tuna cakes on a tray and place in the fridge for several minutes. For the DIPPING SAUCE, heat the oil in a saucepan and fry the onion until soft and fragrant. Add the rest of the ingredients and simmer for 30 minutes or until almost caramelised. Heat more oil in frying pan and fry the cakes until golden brown. Serve with the dipping sauce and lemon wedges. Fish cakes freeze well. Simply wrap each one in clingfilm and freeze for no longer than 2 months.